Canada has recently downgraded the protection of humpback whales under the Species as Risk Act. 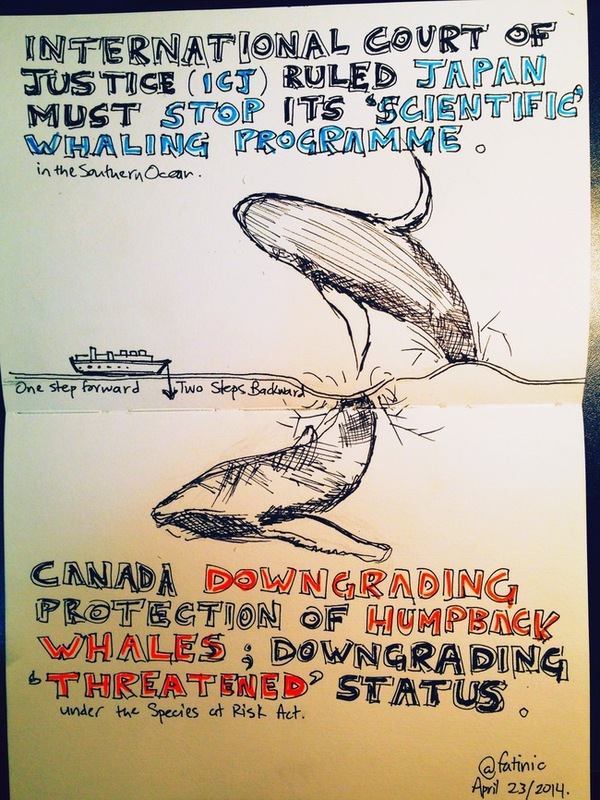 Found off the coast of BC, these whales are being categorized as “species of special concern” instead of “threatened”. The reason behind this decision is being attributed to 2011 recommendations by Committee on the Status of Endangered Wildlife in Canada (COSEWIC) and the observation that their population has increased “significantly” according to the Canadian government. In a CBC radio interview, University of Toronto’s Andrea Olive reacted by saying that she’s not shocked but it’s disappointing. Perhaps what frustrates me the most is that while we should be celebrating this news — their population is no longer near extinction — I am unable to find comfort in the news given the track record of the government and its systematic gutting of environmental regulations that undermine economic development. In contrast, the International Court of Justice (ICJ) recently ordered Japan to stop its whaling programme in the Southern Ocean. ICJ found that while Japan claimed to take minke, fin, and humpback whales for scientific research, it was rather commercial. NGOs such as WWF and Greenpeace supported this decision. It’s also relevant to know that commercial whaling has been banned since 1986 by the International Whaling Commission (IWC). Read the National Geographic article for more details. 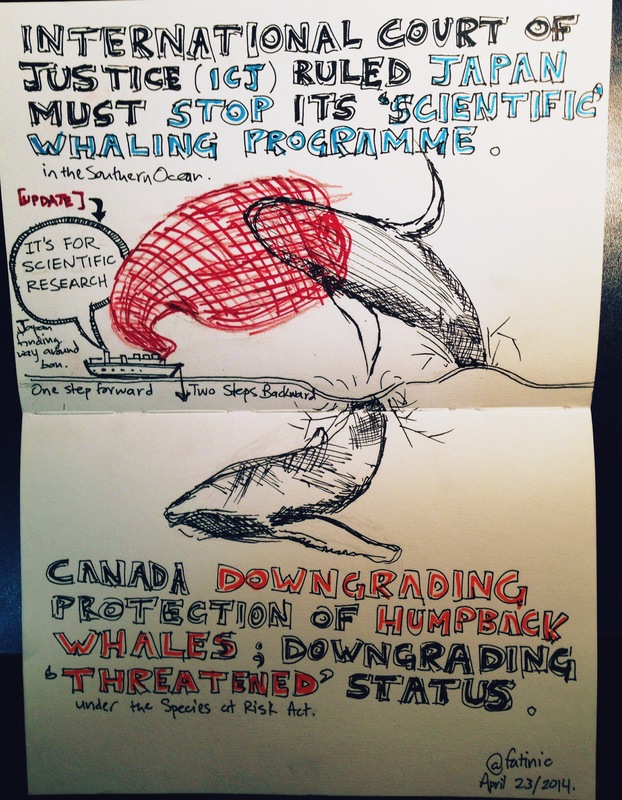 The ruling makes it clear that whaling can be legal if it’s actually carried out for research purposes. Japan is being forced to restructure its whaling from the ground up to turn it into a real research program. Aside from the fact that both these stories are about whales, an interesting observation can be made about the role of science. On the one hand, it seems science when convenient can mobilize political forces quite fast. Alternatively, the call for science can also be manipulated to obfuscate laws and carry out harmful activities. Ultimately, it is necessary to protect these marine species at a time when our oceans are at risk. While we seem to relish the rare sightings of these majestic mammals from the comfort of expedition boats, we should extend our empathy and think about the consequences of our shortsighted actions. I am currently a finalist for UNEP World Environment Day vlogging competition. Final round is based on social media so each view and share counts. It would be great if you took a look at my video here snip.ly/BGN and shared it using the hashtag #WED2014 on facebook/twitter etc.